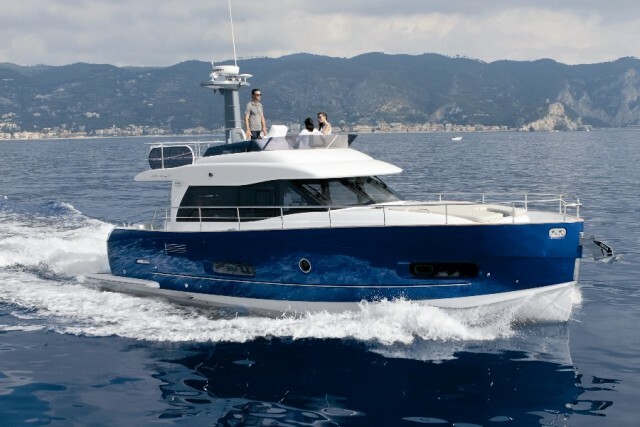 Azimut 55: Art and science come together in one beefy, yet beautiful package. There are no hard edges in the look designer Stefano Righini created for the Azimut 55. The Azimut 55 is a masterful blend of style and substance — one that combines centuries of Italian classic design tradition with the sophistication and power of 21st century technology. 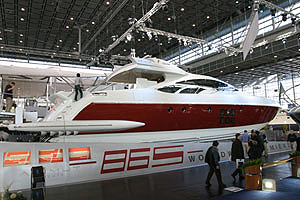 The 55 is the latest example of the proud tradition of Italian boat building carried on at the Azimut-Benetti shipyards. 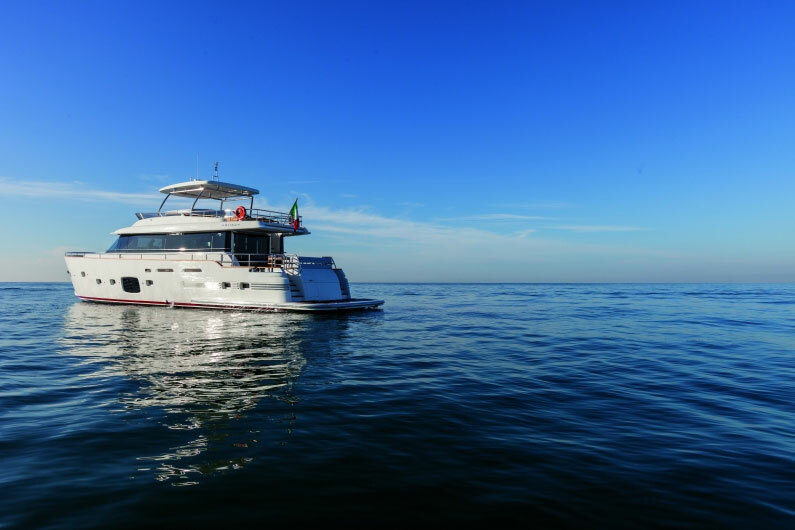 Spread over six locations in Northern Italy, the company builds motoryachts from the 30-foot range to over 160 feet in length. The art of the Azimut 55 lies in its appearance. Every line of the superstructure is a sleek curve. There are no hard edges in the look Stefano Righini created for the 55. Likewise, the interior is a study in flow. Interior designer Carlo Galeazzi gracefully moves the eye from one space to the next. The science is not as readily apparent, but it becomes evident once you take the wheel. In the engine room, a pair of Caterpillar C12 diesels stand ready to move you, both literally and figuratively, with the power of 1,420 horses. Electronics, from the navigation systems at the helm to the entertainment gear located throughout the boat, is state-of-the-art. Since they do a lot of cruising on the Mediterranean, the Italians know a thing or two about outdoor living. 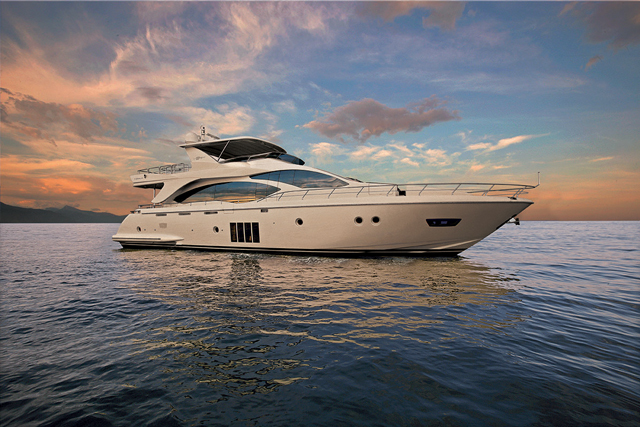 So, the Azimut 55 is made for enjoying life "alfresco." The flybridge offers a large sunpad on the starboard side, opposite the helm. For dining, part of it converts to a seat back, creating room for up to eight adults. An entertainment center holds a barbecue grill, an ice-maker and a sink. The flybridge deck continues aft, with space for a davit and a tender. As an option, you can put a sunpad here instead — and you'll find an additional sunpad on the foredeck. Although there are canvas options for covering the upper deck, the cockpit is protected from the sun full time by a flybridge overhang. There's space for a table and chairs, to enjoy a meal or other activities. 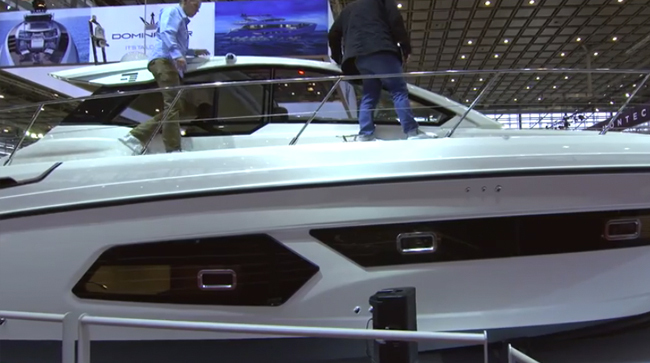 The Azimut 55's integrated swim platform continues the teak decking from the cockpit and sidedecks. It measures just over 4 feet in length fore to aft, providing generous space for water toys. As an option, you can equip your boat with a powered passarelle for stern-in boarding. It stores out of the way, along the transom. The 55's saloon is surrounded by large expanses of glass. The entry from the cockpit is a floor-to-ceiling sliding glass door. It extends the "open plan" vista throughout nearly two-thirds the length of the boat — from the cockpit to the windshield. American cherry wood is used throughout the interior — but, oh, what the Italians have done with it. Many of the large vertical wood panels are crafted in a checkerboard pattern. Each of the 10-inch square blocks has grain running at 90-degree angles from the next, and they are done in a high-gloss finish. The saloon seating and cabinetry are both designed in keeping with the "curves" motif of the boat. There's a U-shaped settee to port when you enter from the cockpit. The settee faces an entertainment center along the starboard side, just under the windows, crafted in an elegant mix of cherry and briar woods. A bottle compartment inside it has a clear plexiglass door and mirrored interior. The flow of the space gently takes you up two steps to the next level of the saloon. Here, the galley is to port, the dining area is to starboard and the lower helm station is forward. The galley is open to the saloon, except for a small cabinet on the aft side. The front of the upright refrigerator/freezer is faced with the checkerboard-patterned wood, adding another touch of elegance. A Granulon countertop along the port side holds a double sink, while another expanse covers an island storage cabinet. It has access from both the galley and dining area, and contains dividers for securing china and crystal. A three-element ceramic cooktop and microwave oven are also standard galley features. There's additional storage forward of the galley, along the bulkheads of the companionway to the lower deck. The dining table is removable — and it can be configured in two different ways, depending on your needs. There's an insert at the center that creates room enough for dining. Take that section out, and you'll have a pair of cocktail tables. 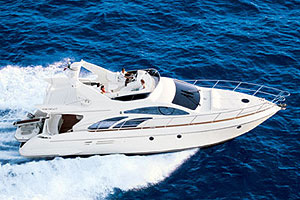 Belowdecks, the Azimut 55 offers three staterooms and two full heads. In none of the compartments will you find any compromise in space. The largest stateroom is the full-beam master suite, located aft. It offers abundant natural light through Azimut's trademark triple oval portlights on each side. There's a queen-size berth set at an angle from the aft port corner, but it gives the appearance of being in the center of the space because of curved bulkheads. A large countertop and vanity on the opposite side completes the circular effect. A grouping of beveled mirror panels on the forward bulkhead covers a double door entrance to a walk-in closet. The en suite master head has a shower stall with a bench. The countertops in both the master and guest baths are done with a glossy resin material Azimut calls "enameled crystal." It gives the appearance of a liquid suspended in air. The roomy VIP stateroom, in the bow, also has a queen-size berth. It is bathed in light from an overhead hatch. The third stateroom has a pair of single berths with stand-up room throughout the walking space. You can bend at the waist to tie your shoes without bumping your head or your behind into a bulkhead. The two staterooms share a common head. It is accessible directly from the VIP cabin. 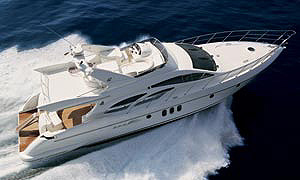 As an option, the Azimut 55 can be configured with a crew cabin. It is accessible through a hatch in the cockpit deck, and it offers a single berth and a head compartment. Otherwise, this space can be used for storage. Art and science also come together at the Azimut 55's two helm stations. The lower station's styling is in keeping with the curves and wood trim in the rest of the saloon. The upper station is also a study in smooth and graceful lines, but it is executed in white gelcoat. They can be fitted with identical electronics packages, as both stations have space for large-screen displays. Standard features include Mathers MicroCommader single-lever electronic controls, Caterpillar engine instrumentation, Raymarine data displays and an adjustable-height steering wheel. 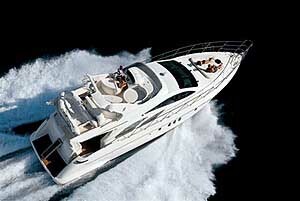 The Azimut 55 has only one power option: the standard pair of 710 hp Caterpillar diesels. They give the boat a top speed of around 32 knots. The boat cruises at around 27 knots, at which pace the boat has a range of more than 300 statute miles — with some reserve. The hull deadrise is 23 degrees at midship and flattens to 16.6 degrees aft, so it slices into chop smoothly, yet gives a stable ride with minimal roll. Because of the flybridge overhang, the skipper loses considerable visibility aft. The lower station, because of the vast expanse of glass in the saloon, actually provides better all-around sightlines. If you seek a capable cruiser with an enviable Italian pedigree, all the comforts of home (and then some) and styling that will have other boaters turning their heads in wide-eyed wonder, the Azimut 55 just might be what you're looking for. 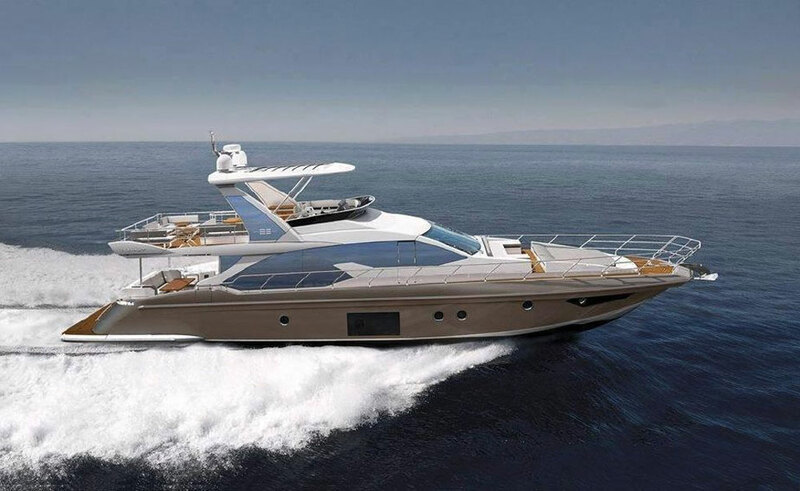 This exceptional motoryacht is as much fun to operate as it is to gaze upon. Mathers MicroCommander electronic controls; VacuFlush heads; 5 kw auxiliary generator; three-burner ceramic cooktop; upright refrigerator/freezer; Raymarine Tridata instrumentation; Raymarine VHF radio. Air conditioning; crew quarters; passarelle; washer and dryer; Glendinning Cablemaster; cookware, dishes and utensils for eight.